Blog Quick Quotes: Triangle Fun and Bonus Projects! Triangle Fun and Bonus Projects! Hello everyone and happy Tuesday to you from Donna! Today I wanted to share with you two projects I made this week. This first is this layout using the Quick Quotes 6x6 Dusty Road paper pad. The word is triangles are the new trend, and 6x6 pads are so much fun to use for this technique. I found an awesome sketch which I use for the foundation of my layout over at Scrapbook Friends. 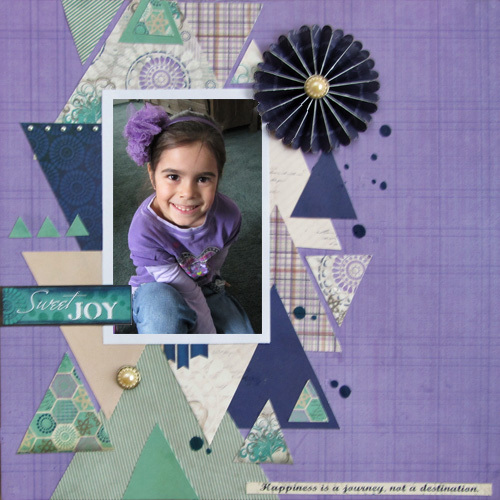 Just cut lots of triangles in different sizes and place them on your layout. All the paper was from the 6x6 pad except the flower which I made at a Quick Quotes Super Weekend class, you can find about it here! My second project was this cute little fry box from the April Quick Quotes Club Q Option B Kit. I altered the tags and instead of making a mini album with the tags, I used them to make a gift card holder and a card for a special friend who always is there for me and makes me smile everytime we are together. I think I will throw a small bottle of her favorite lotion in there too! Here is the gift card holder which was so easy to make, using the brad attach two tags and decorate! The Dusty Road 6x6 paper pack made it a snap to decorate. As you can see it swings open to reveal a gift card. Simply attach your gift card with a glue dot! Lastly, here is a card that I used two tags and attached them on the side. Thanks for stopping by Quick Quotes blog today and spending a few moments with us. If you get a chance please feel free to visit my blog to see even more of my Quick Quotes creations! LOVE that layout!!! All those triangles are so awesome. What a fabulous layout! The triangles are such a fun element! And that fry box is so fun! Love it! Both of these projects are simply awesome, Donna! I love how you created a background of triangles on your layout.